Welcome to my page of travel insights. Join me on my travel adventures as I explore places to enjoy campfires and build sandcastles. Hope you have a nice stay! Day One of our tour to the Department of Santander on the eastern side of Colombia was spent in its capital city, Bucaramanga. Bucaramanga is a metropolitan area of over a million people nestled on a plateau among the Colombian Andes. One of the best views of the city is from the airport which is located at elevation on the mountain. As you leave the airport you can see down onto the city which is surrounded by these beautiful emerald mountains ringed with fluffy, dense clouds. The city itself is sprawling with many designated areas and neighborhoods, each with their own character. Bucaramanga is not yet a popular tourist destination, more of a middle-class working city, but with the increase in tourism in all of Colombia after the recent peace agreement, it will continue to grow in Bucaramanga too. Leaving the airport, we arrived in the nearby city of Girón, which is part of the greater Bucaramanga metropolitan area. Founded in the 1600s, Girón is a National Monument of Colombia, with its mandatory white-walled, dark brown painted doors, and red-tiled roof buildings. View down a typical street in Girón. In the city square is the beautiful and imposing Basílica Menor de San Juan Bautista, where I was met by a fortune teller who wanted to read my palm. I responded with my typical "no gracias." We enjoyed the best dessert we’ve had yet in Colombia at a small ice cream shop in the Parque Paeralta area of town (on Carrea 28). It is a hollowed-out oro miel piña (honey gold pineapple) filled with coconut ice cream, pieces of the pineapple, whipped cream and a cherry on top. The pineapple is so sweet and a product of the area. We were so enchanted by the taste that we are now continuously on the search to find them in Cartagena too. Oro miel piña (honey gold pineapple) dessert in Girón. The city also has a popular park that runs between Calle 27 and the Rio de Oro (River of Gold) that was packed on the Sunday afternoon that we visited. 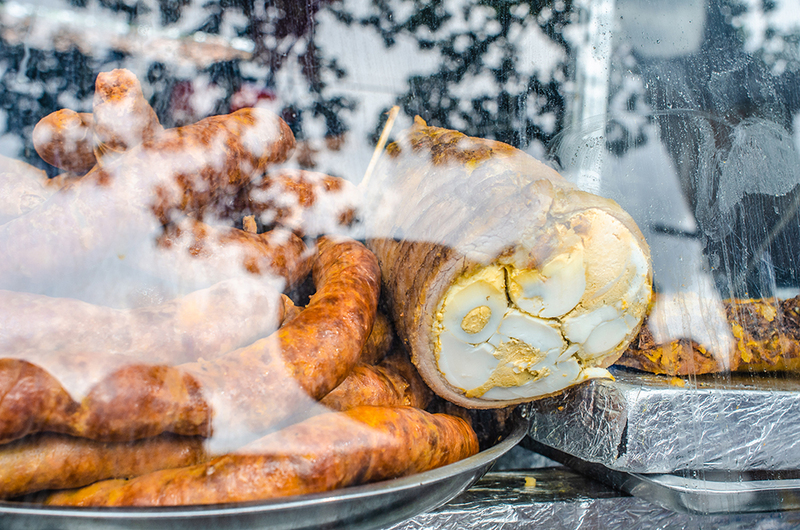 It is where you can order fritanga from any number of vendors in the park which is essentially a pile of various fried meat products…sausage, pork, etc. It’s basically meat wrapped in fried meat. Meat products that make up the fritanga plate. Our guide also shared with us the sordid past of this plate…many decades ago “people” were also included in the meat plate, unbeknownst to the patrons. In an era where there were many mass killings and little options for burial, apparently the vendors were forced by a few influential powers to help dispose of the bodies by serving them among the other fried meat parts. This is clearly no longer practiced, but we didn’t indulge in the meat plate after just finishing our pineapple dessert. A relatively recent addition to the area of Bucaramanga is the 120-foot statue of Jesus found in the Ecoparque Cerro del Santísimo, which is technically in the town of Floridablanca. Taking a gondola up to the top of the mountain, the sight is similar to the Christ the Redeemer statue found in Brazil. For a nominal fee you can even take an elevator to the top of the statue and look down upon the city of Bucaramanga below. We did so at night when a lightning storm was rolling in on the distant mountains and it was spectacular. 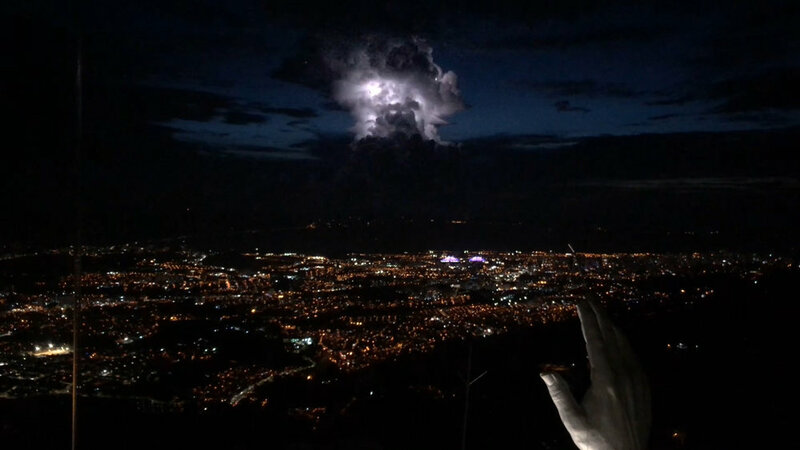 View of a lightning storm from the top of the Christ statue. The park also has a main stage where there was a dance troop demonstrating various traditional Colombian dances. Plus, there is a nightly water show where the fountain in front of the stage is coordinated to water and lights. We ate at the restaurant at the top of the park, Menzuly, and were introduced to goat on the menu, which my husband learned he rather liked. Christ statue at the Ecoparque Cerro del Santísimo. 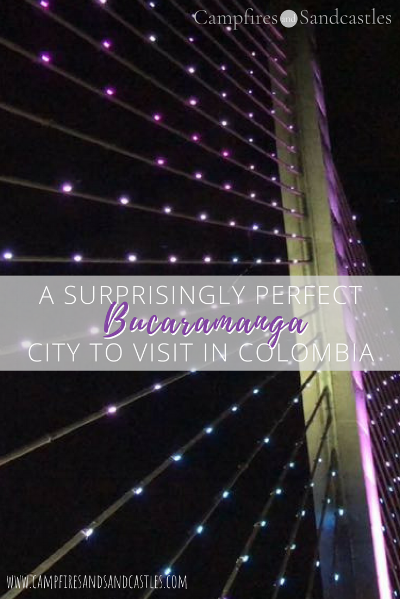 Santísimo also provides a good view of the lighted bridge in Bucaramanga called the “Puente de la Novena.” It is a two-pillared cable suspension bridge that the city has lit with LED lights that change colors displaying scenes like the Colombian flag, a rainbow, etc. We even stopped on the bridge on the way to our hotel to get out and walk along it a bit, which is a popular tourist attraction. We spent the first night at the Hotel Dann Carlton in Bucaramanga. What a pleasant hotel. The bellhop was attentive, the reception desk staff were a pleasure (and spoke English), and the rooms were perfect. We even had two adjoining rooms, since our middle-school aged kids no longer want to share a double bed and prefer their own beds. The best part was the breakfast the hotel served. Located on the roof deck, overlooking the city below, they had made-to-order omelets, fresh fruit and fruit juices, pastries, and hot dishes. From Bucaramanga we made our way to Guadalupe. Learn more about this other quaint little town with its spectacular red river that is becoming quite the tourist destination after a YouTube video went viral. Read more here. Location: Bucaramanga is located on the eastern side of Colombia in the Department of Santander. Getting there: Bucaramanga has its own international airport named Palonegro International Airport (Airport code = BGA). Famous artisan product: Bucaramanga is known for its leather shoe district. Unfortunately, we did not have time to visit, but it has been highly recommended to us. Click to Pin, Save, and Enjoy! Subscribe to the C&S newsletter for new blog posts, yummy travel-based recipes and helpful travel hints! 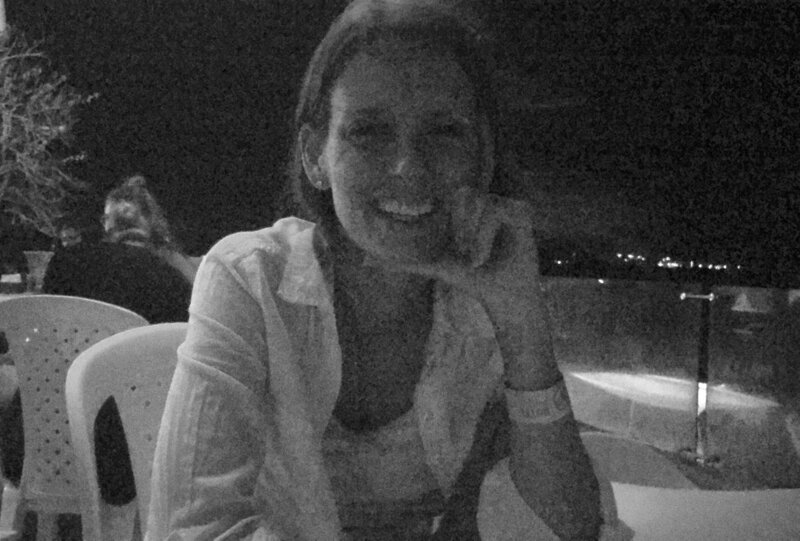 I am a travel blogger who specializes in exploring places to enjoy campfires and build sandcastles as a family. My goal is to provide you with some helpful information and tools to inspire you and your family to discover a new place and create your own memories!